Me and my friends Jowan Sebastian, Tom Brimson and Liam Dennis wanted to organise a night that could double as a showcase for fun interactive things that we wanted to make. Halloween seemed like a good night for that. With the help of Jack Williams, we put on the night at 5 below. My addition was to help create some sound effects buttons that were placed around the bar and fed through the main PA and help create a big LED filled crucifix. 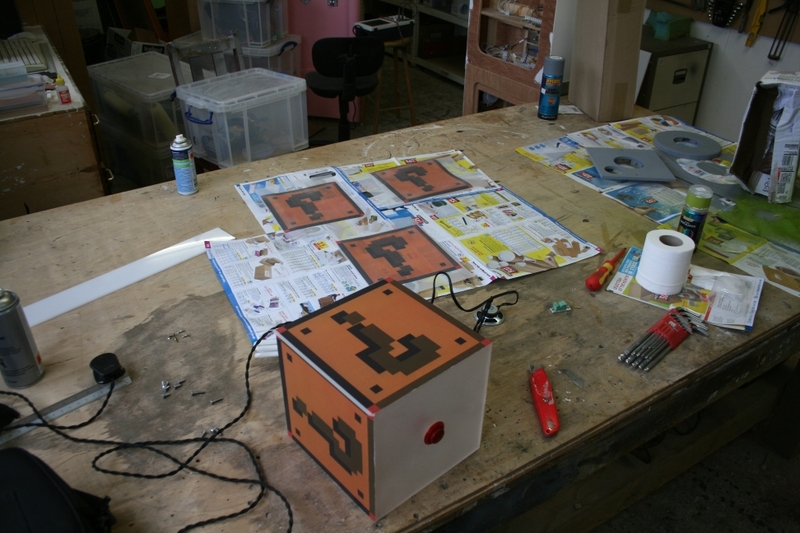 The sound effects were made using a board based on Lady Ada’s Waveshield, similar to the board I made for my Mario Lamp. 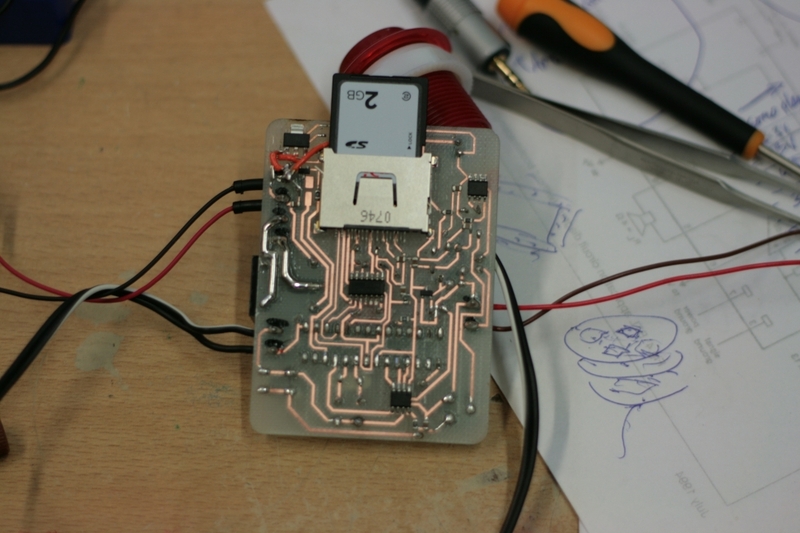 It consists of an Arduino shield that reads WAV files off an SD card and plays them out through a 3.5mm jack. 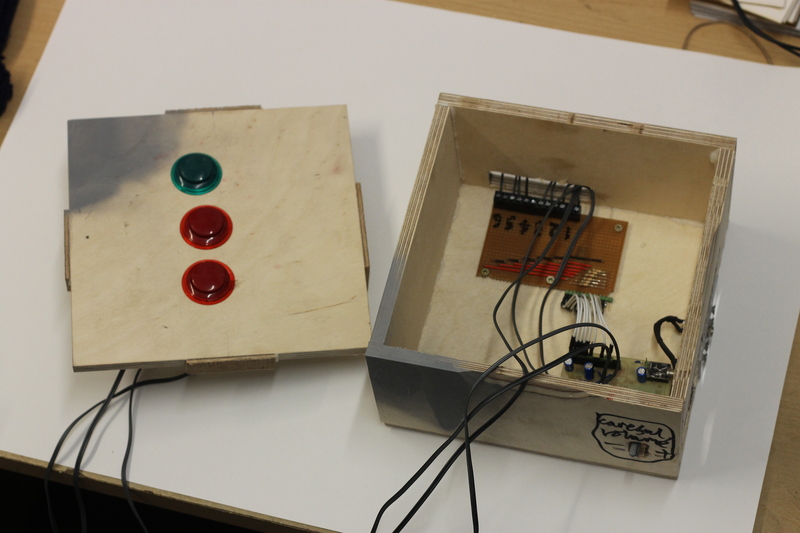 There are 6 buttons that trigger 6 different sound effects. 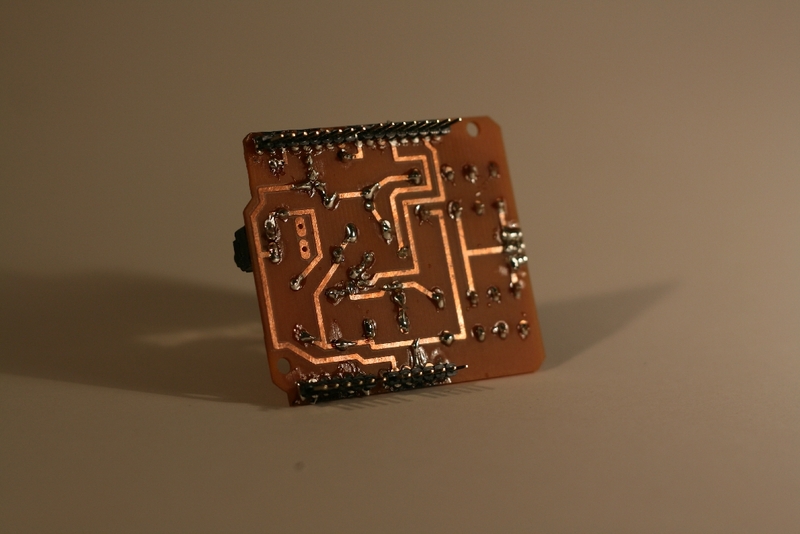 I made it using SMD components so I had to rejiggle the original design around a little in Eagle. 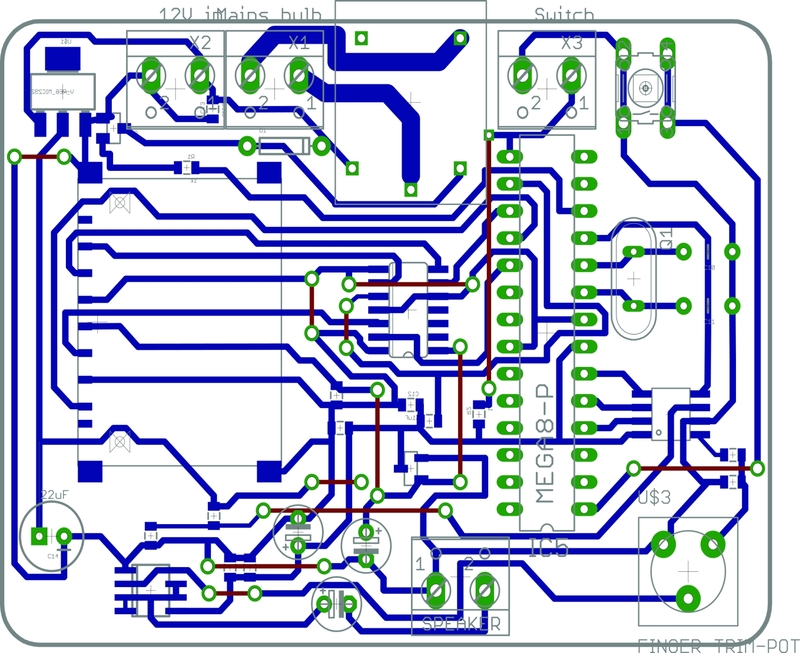 Here is the board and the schematic. This is the audio player, housed within a wooden box. 3 of the 6 buttons are mounted in the lid, for the DJ to operate. 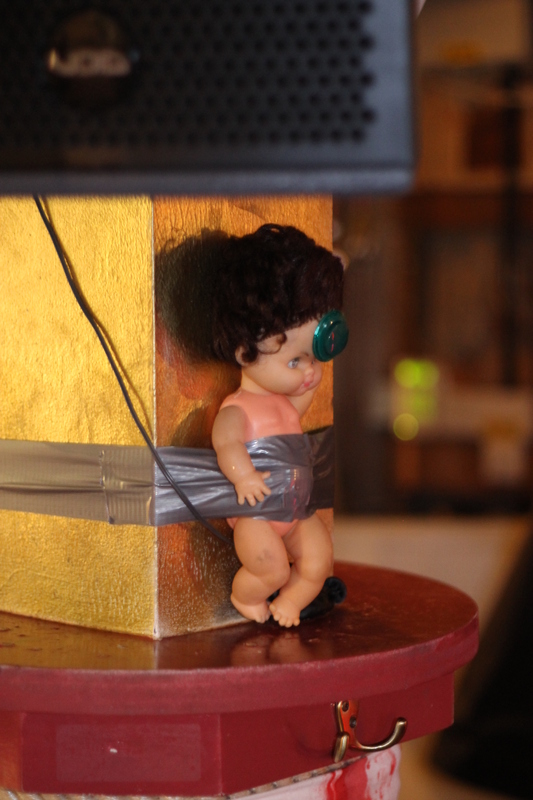 The remaining 3 were placed inside dolls and attached around the bar. As well as the sound box, we constructed the cross. 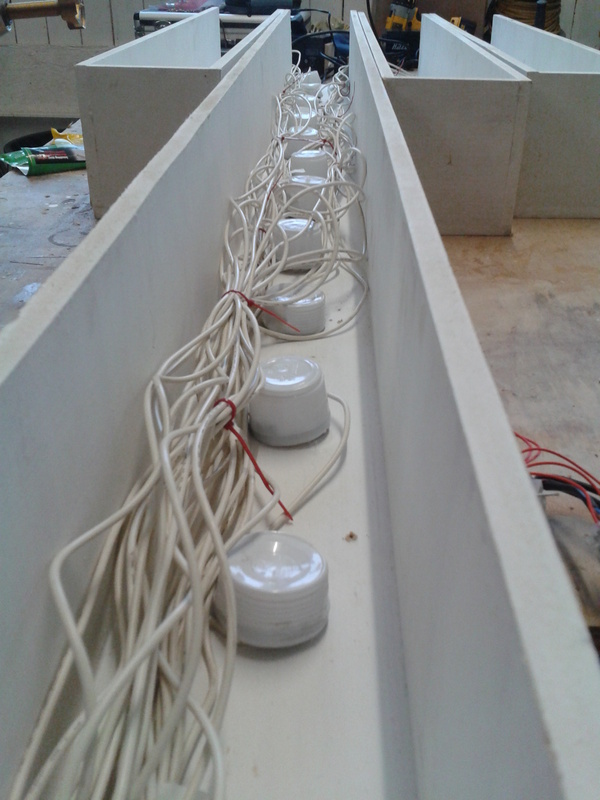 We made MDF boxes to house the lights and covered them with tracing paper and perspex to diffuse the light. 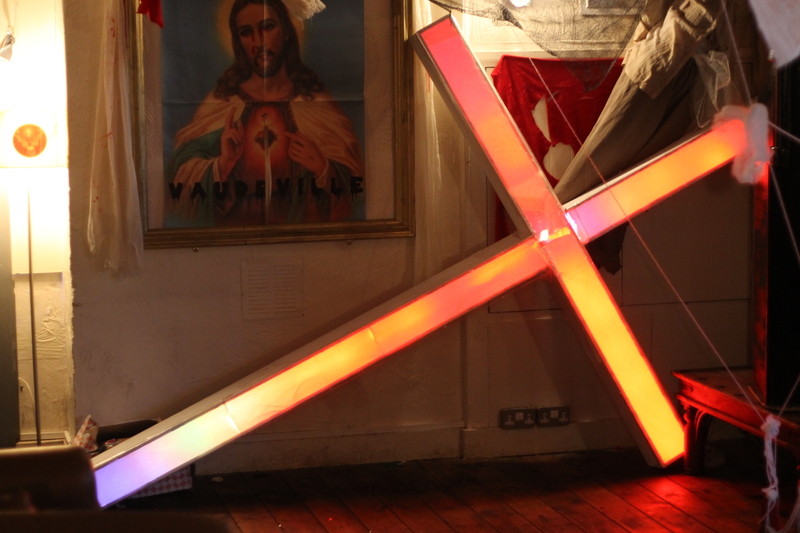 Here is the crucifix assembled in the bar with an automatic RGB sequence. 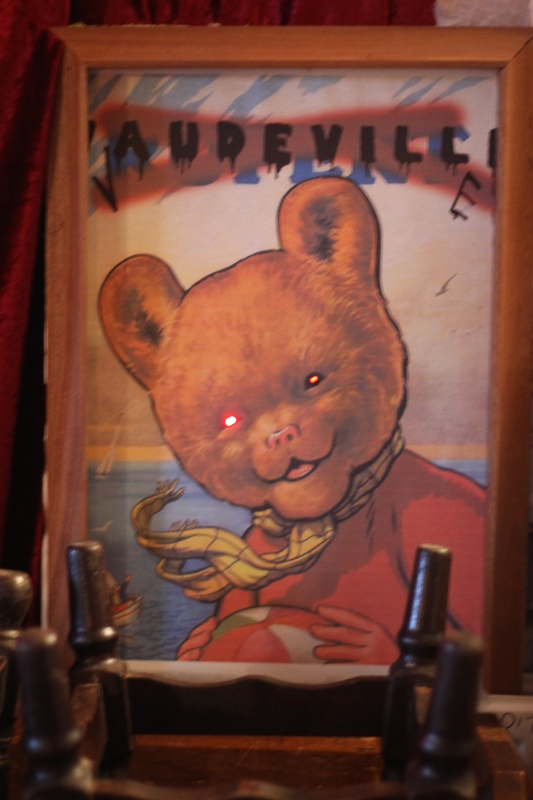 As every halloween party needs, A spooky rupert the bear poster. 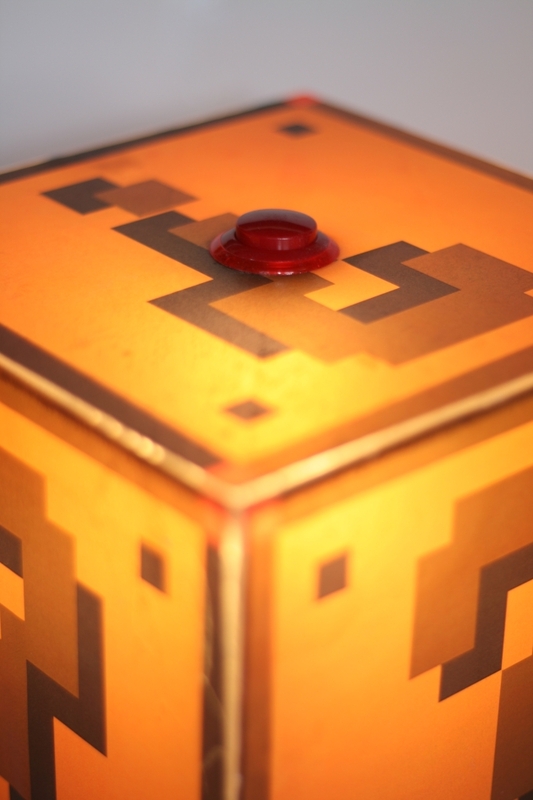 It was my friend Scott’s birthday and I was wondering what to get when I thought about the idea of this coin cube light from Mario, then I thought it would be good to add in a sound effect for when it turns on and off. Below is a video showing it going on and off and on and off. After a bit of research I decided to go for a design based on the WaveShield by LadyAda with an Arduino all on one board. This could then control a relay to turn on and off the light. 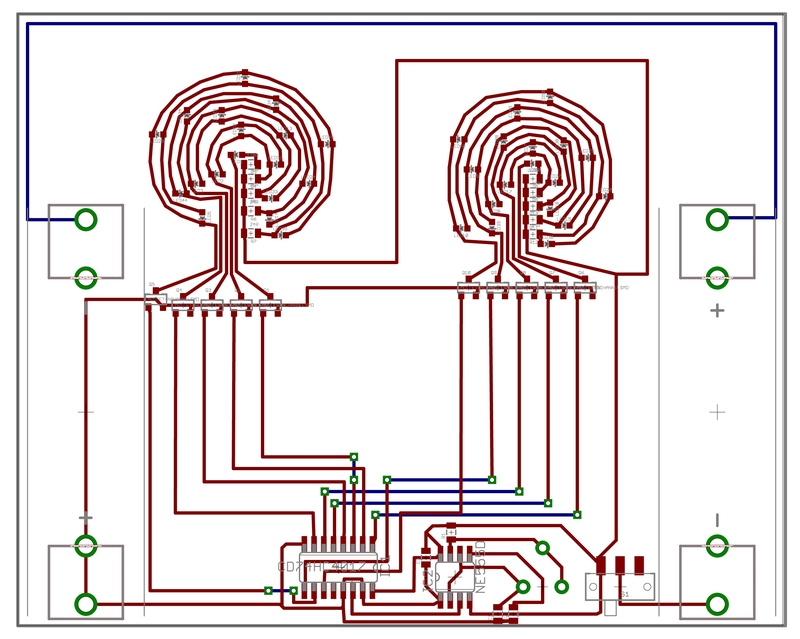 I basically used the same design as the waveshield, using an SD card with a DAC and an Op amp and a buffer to help things along. I used the same parts as the original WaveShield but used SOIC packages instead of DIP and left out all the other headers. 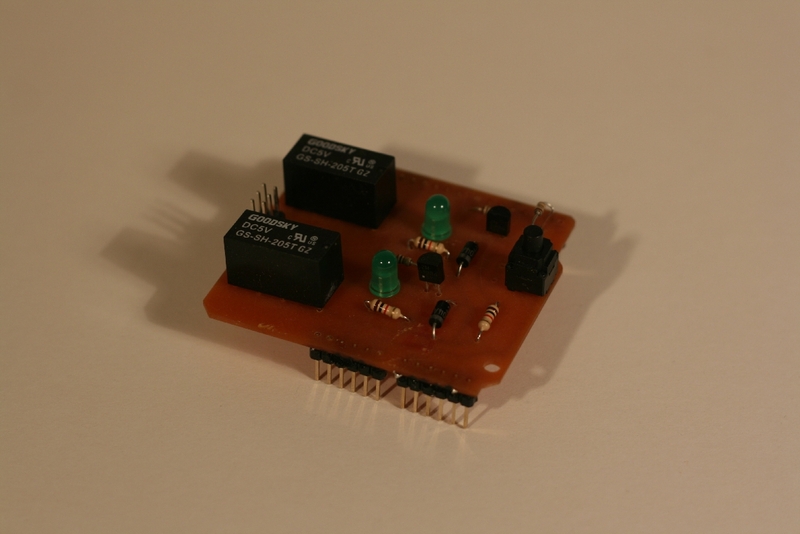 I added in space for an Atmega328 with the Arduino bootloader and a crystal as well as a 5V and 3.3V regulators. It all fitted together onto a pretty small board. 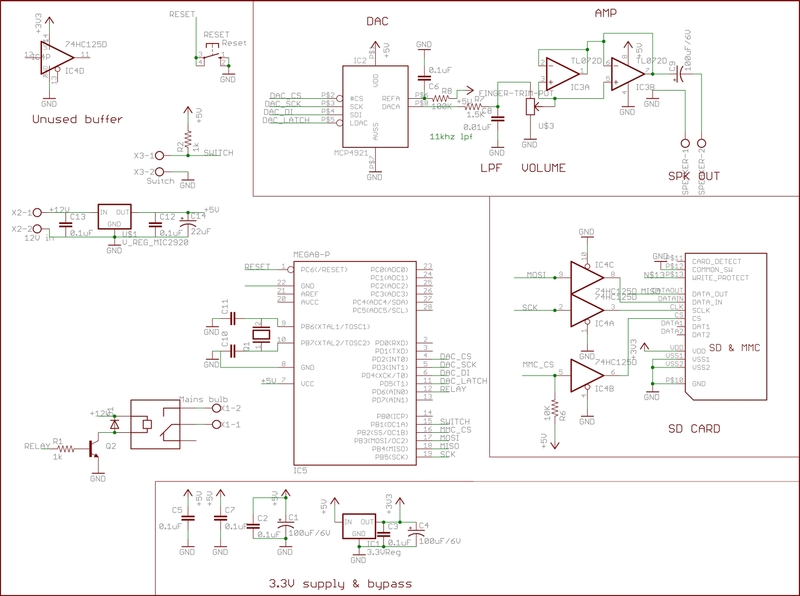 Below is a schematic and board image. In hindsight, something I would definately change is to give the mains side of the relay a lot more space away from the other bits, as well as add in a fuse onto the board. You can download the Eagle files at the bottom. I breadboarded it up by making little breakout boards for the SOIC parts. 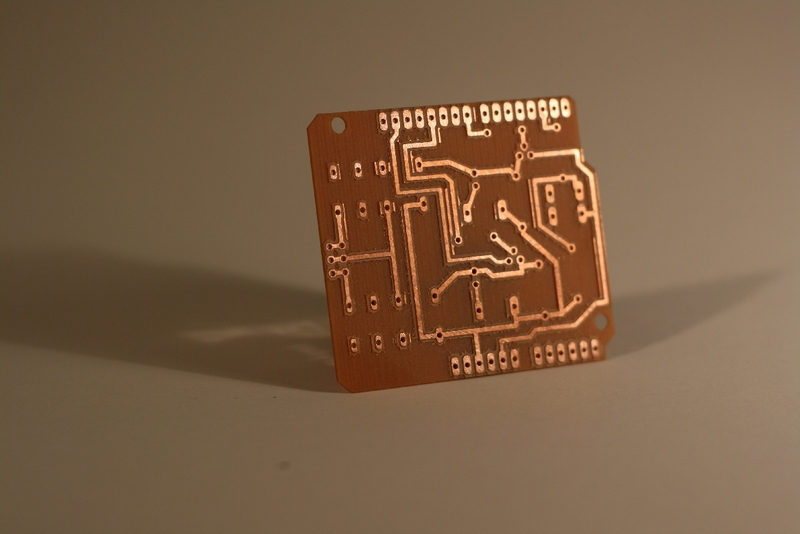 Once this was all OK, I cut out the PCB on the milling machine, then soldered it all up. 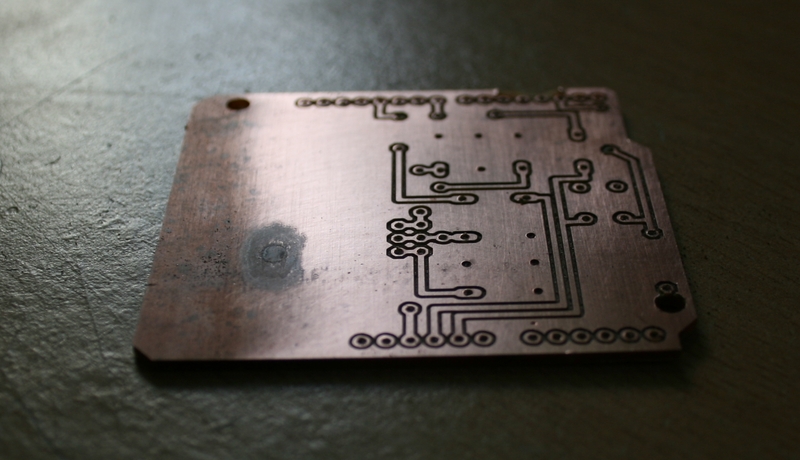 I used a little tube of solder paste and daubed it onto the copper pads using a pin. 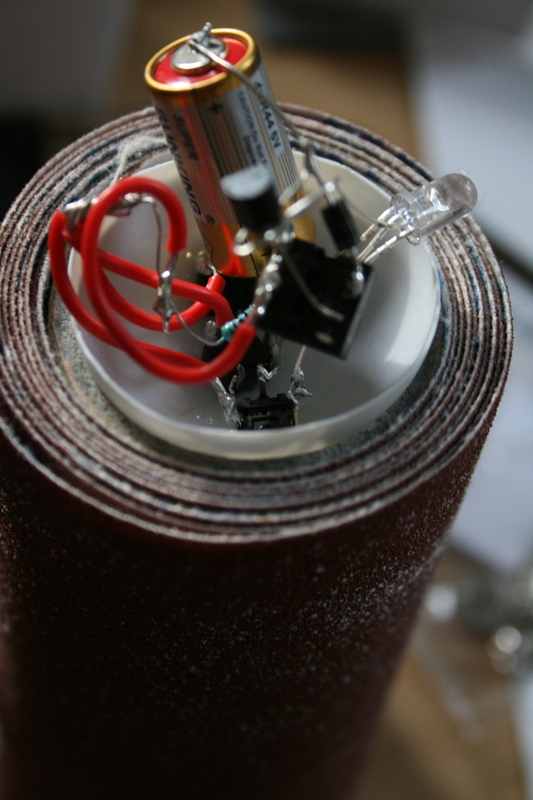 It’s pretty monotonous doing this, but it’s satisfying when you use the hot air gun to melt all the solder joints together. 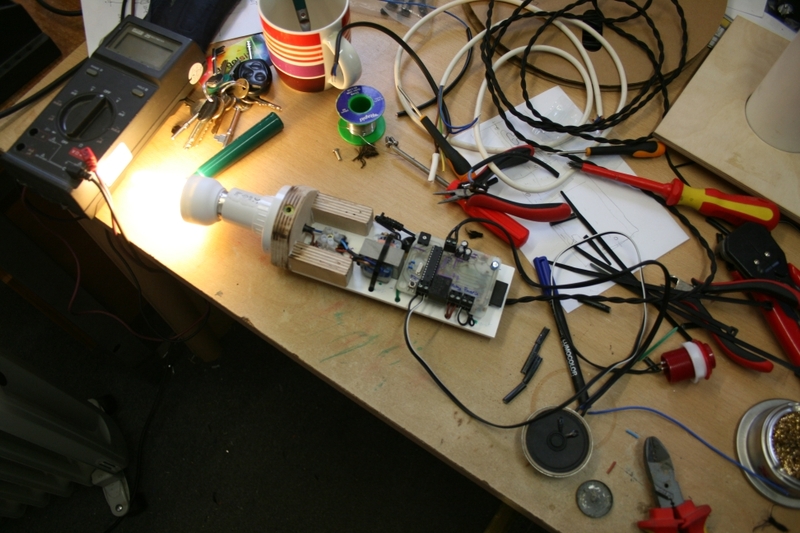 Next was to test out whether the relay works with the light bulb. 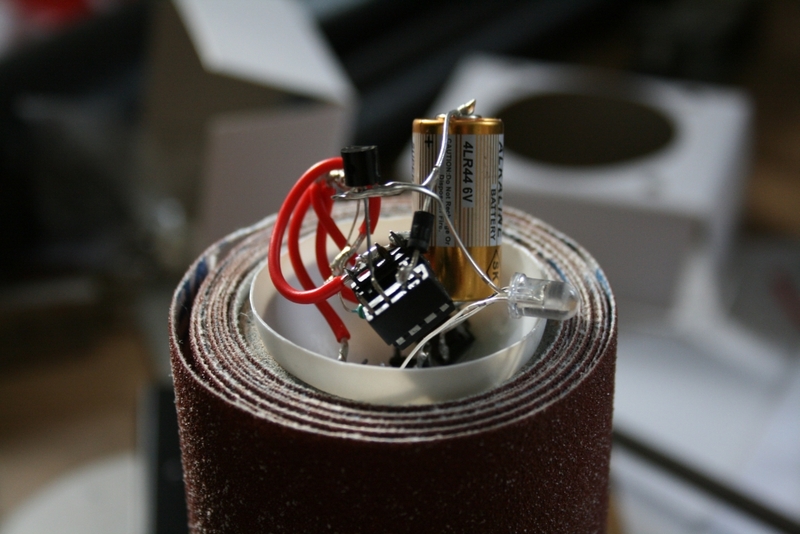 All the electronics are mounted into the central column, which is a piece of 82mm drain pipe, so I fixed them onto a board with a small power supply that I took out of a 6V walwart. This is probably a pretty dangerous way of doing things. At least it’s a bit scary working with mains electricity and I always imagine everything just melting and burning. 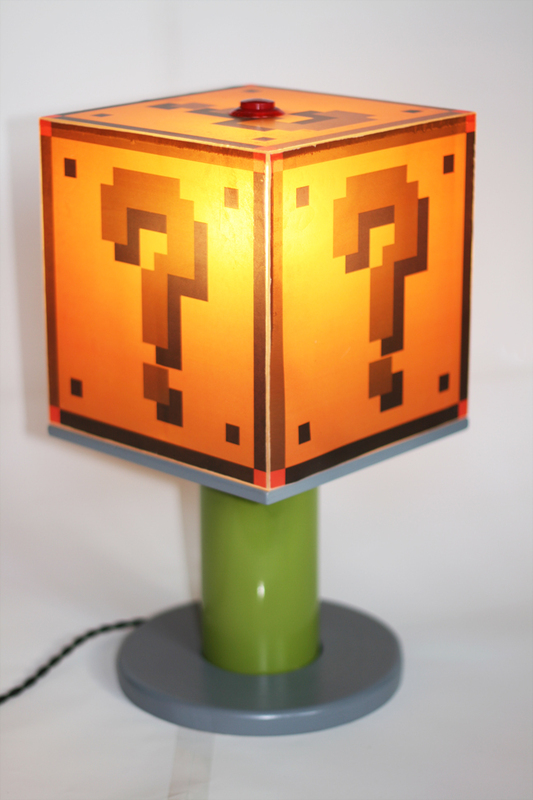 So once all the electronics was done, I got on with making the actual lamp. It was quite a simple design with a base attached to the bottom of the column and a shelf piece that attaches to the top of the column. The light sits in the middle of the shelf, with the speaker to the right. A perspex box fits onto the shelf, with a button in the top. I’ve included some PDFs with the plans at the bottom of the page. 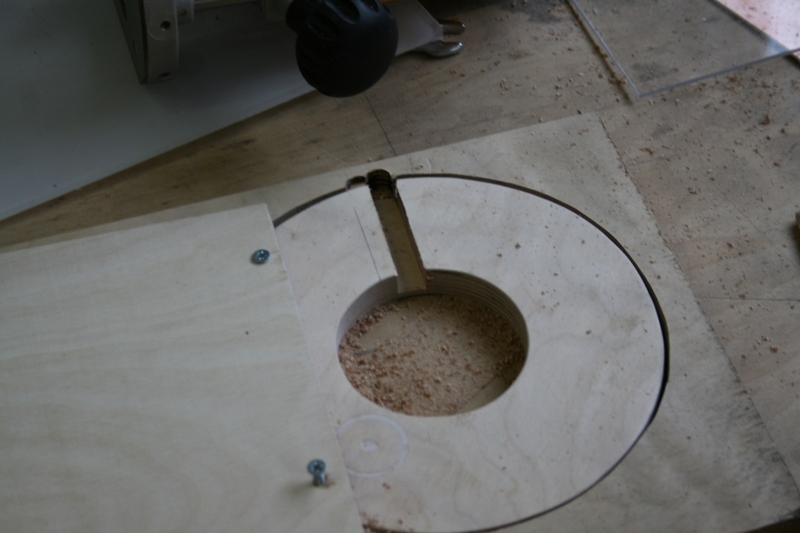 To attach the drain pipe to the wooden base and shelves, I used machine scews going into some M4 threaded inserts. The inserts make things a little bit easier, especially when you’re taking things apart a lot for adjustments. Below are some photos showing it being put together. The mounts used to attach the shelf to the column. 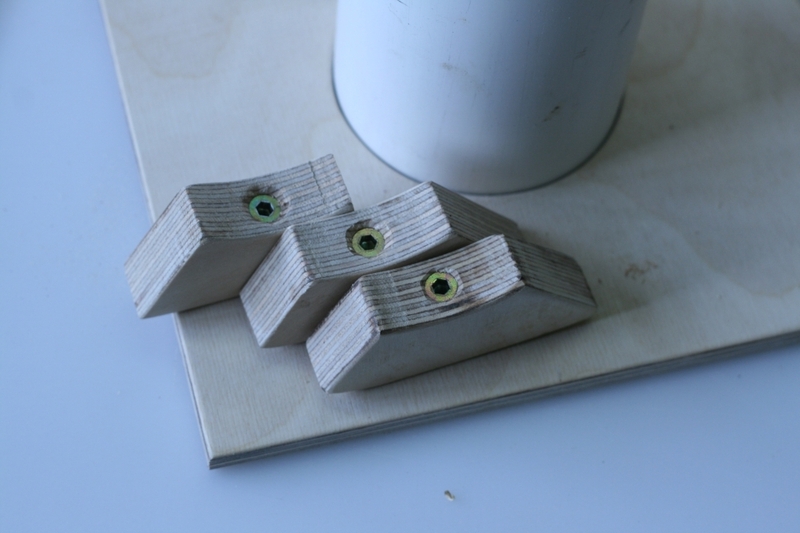 I bolted the column onto the supports then glued them onto the shelf. I used polyurethane glue, because it’s quick and there was some lying around in the workshop, but any wood glue would do. You can see the light fixture in this picture, also mounted into the middle of the column. After cutting out and sanding the piece of plywood I used for the base, I routed a groove for the light flex to come out from. 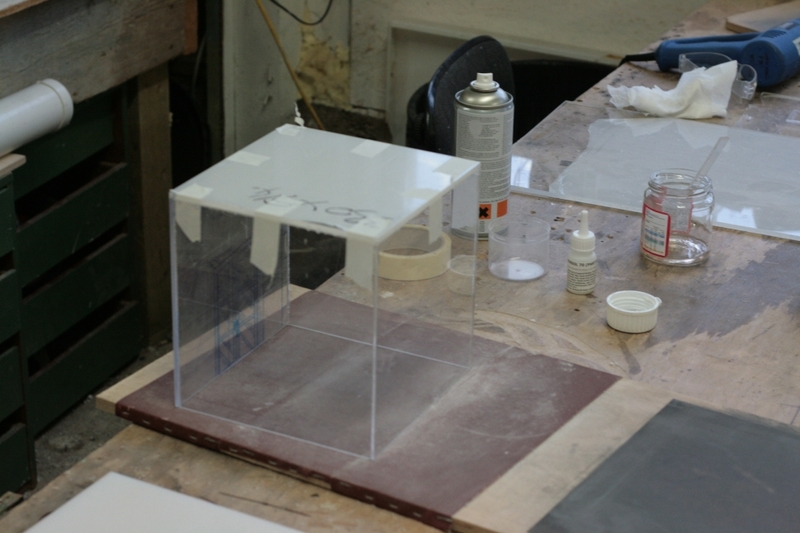 Here is the perspex box that I used for the main cube shape. 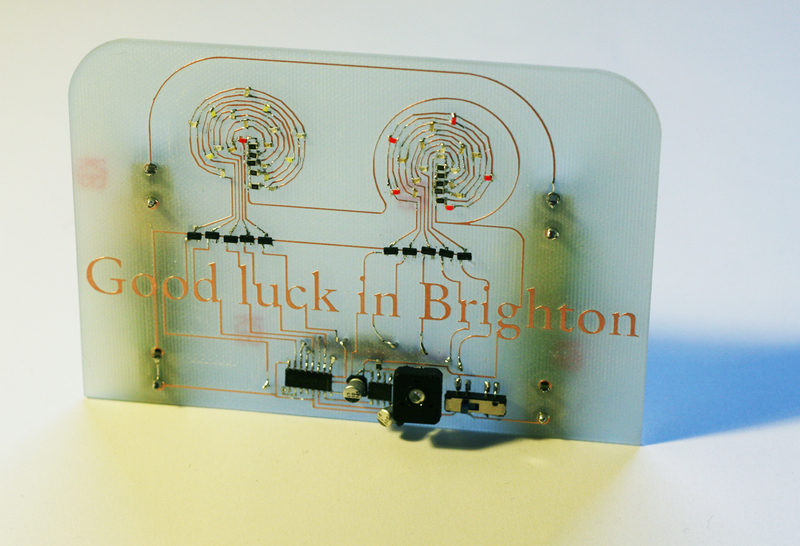 I cut 4 near-squares from 3mm clear perspex and glued the edges using Tensol 70. I’ve used bison glue before, which has a lot less harsh vapours, but is really runny and quite dificult to stop the join getting bubbles in it. Tensol is quite pricey but I think it’s worth it. If you use it, make sure you do it in a VERY well ventiled place. 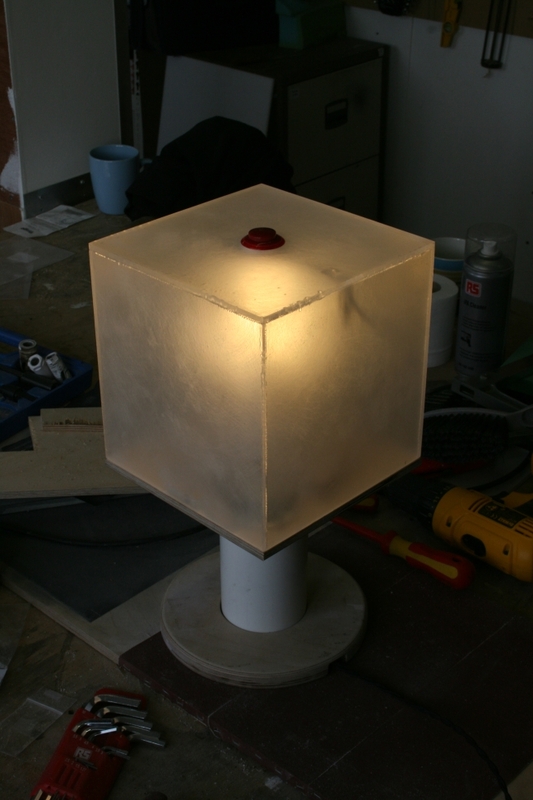 Here’s a picture of the light after I sanded the perspex box. I couldn’t resist assembling it. 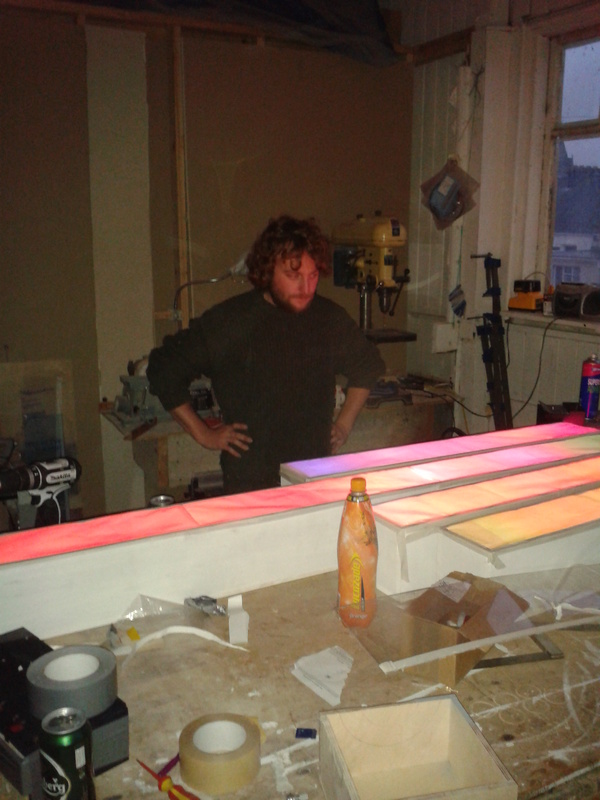 I sanded the perspex to help diffuse the light coming from inside. This allowed me to be slightly less cautious when gluing together the perspex, because I could sand back any bits of glue that oozed out the edges. Here I applied the graphics that I printed. 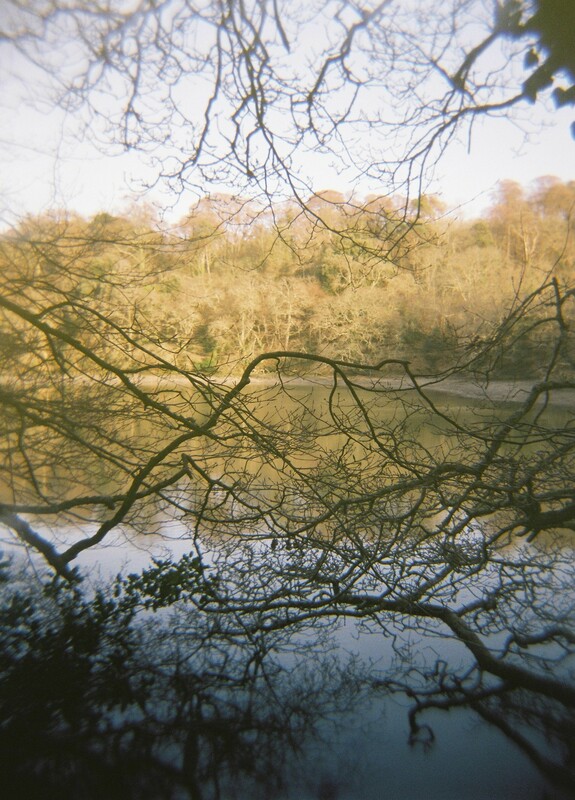 They were just inkjet printed onto tracing paper. 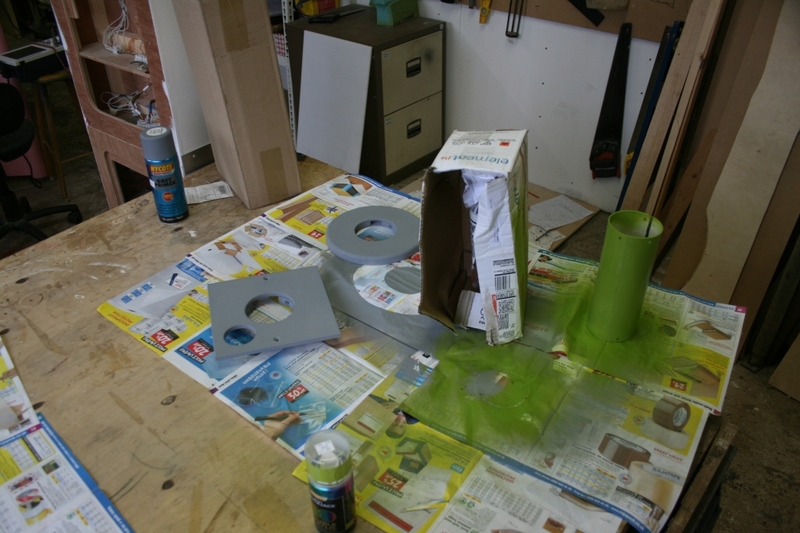 I then sprayed quite a fair amount of Photomount-style spray glue before applying. Once applied, I used the edge of a stanley knife blade to scrape a slight bevel onto each edge, to make the graphics a be little tougher against peeling off. Painting time. 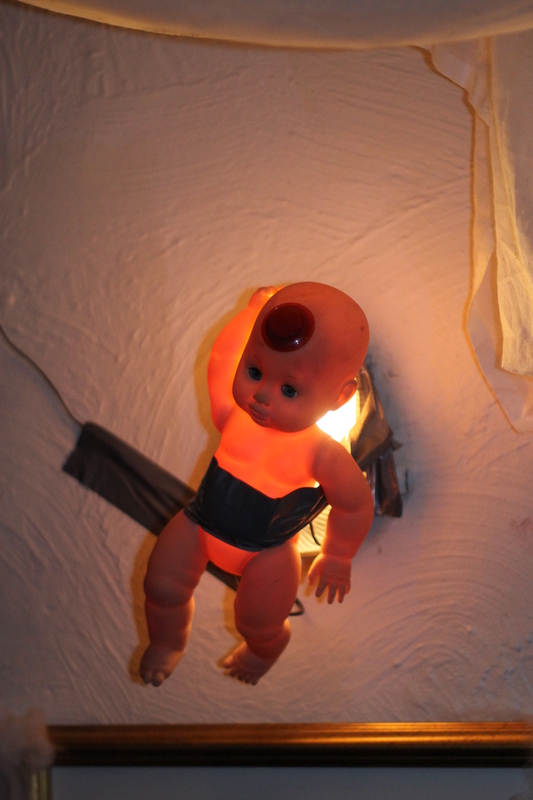 The bits used for this light, were pretty easy to paint with spray paints really. Just a few coats. I just used grey primer for the wood bits then varnished them after. And here’s the finished thing. 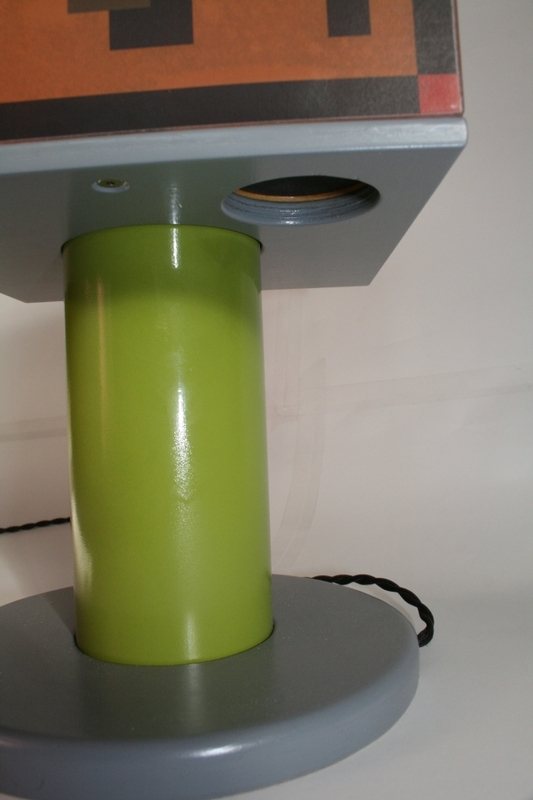 Here’s a view from underneath, showing the speaker and the bolts used to hold the perspex lid onto the shelf. 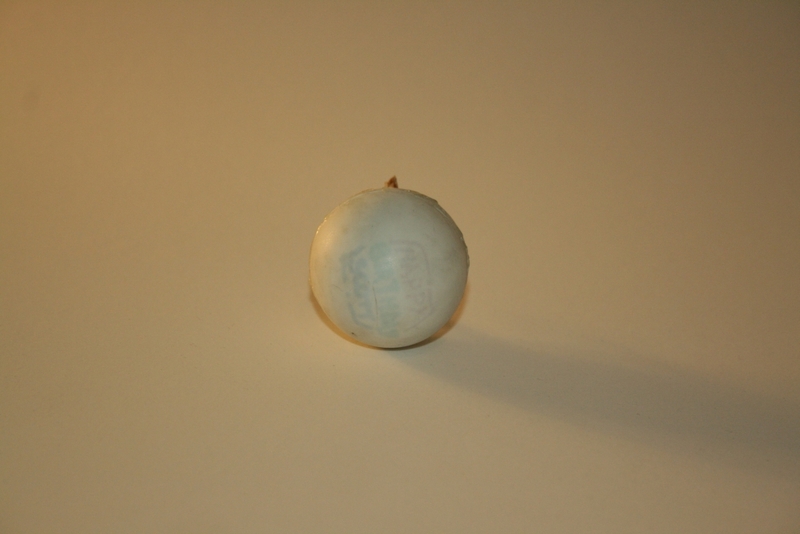 One last image showing the ‘Mario red’ gaming button used to tell the light to do its lighting thing. Things I’d recommend to do better would be to be careful when gluing the perspex together because ozing bits at the joint come through and can be seen from the outside. 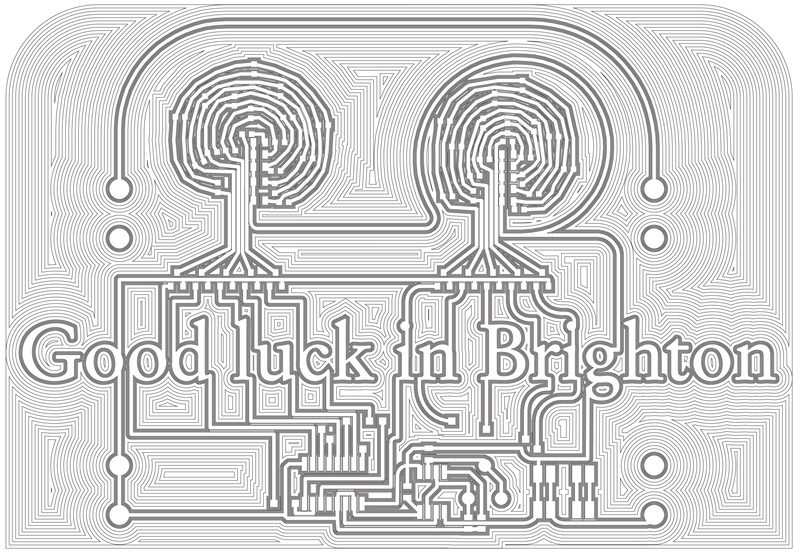 Also, as mentioned before, I think it would be a good idea to do a little redesigning of the circuit board so the mains are a little more isolated. I think it would be a good idea to add a cover to the bottom of the column as well, something I didn’t do. Feel free to leave any comments and if anyone does get round to making one, I’d love to see some pictures! I’ve just set up the github, so sorry if it doesn’t work smoothly. Click on downloads in the top right hand corner to download the files. And here is the partlist with the Farnell order codes, totaling £12.01! 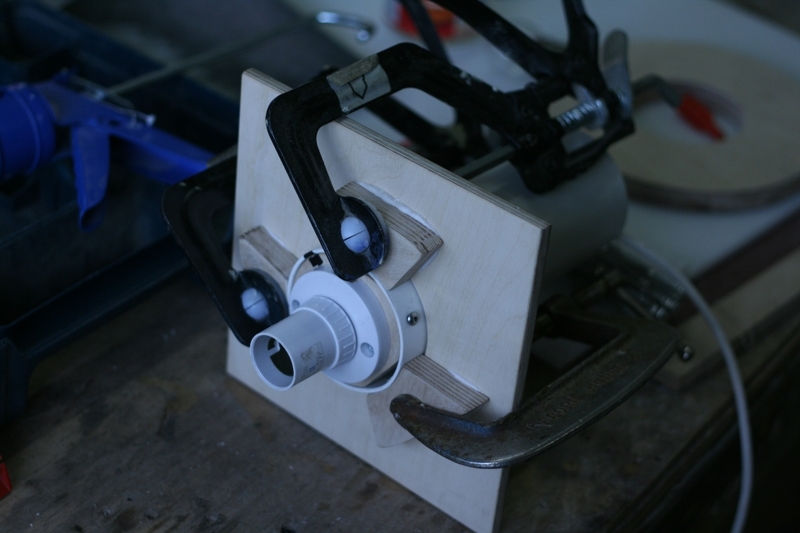 So I made a Intervalometer for my Canon 400d camera at last. It’s another one that’s been in the endlessly long pipeline for a while. 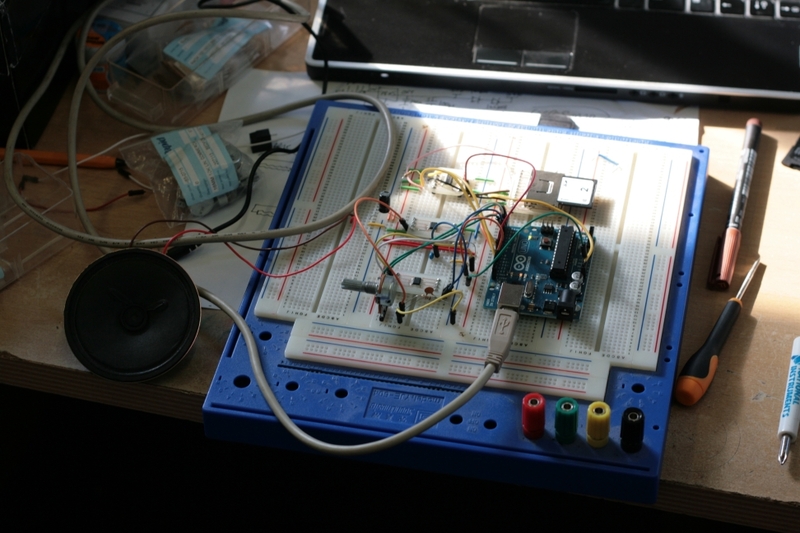 I based it on the wonderful Arduino and got a bit of code off the person that made the Intervaluino whic can be found here. 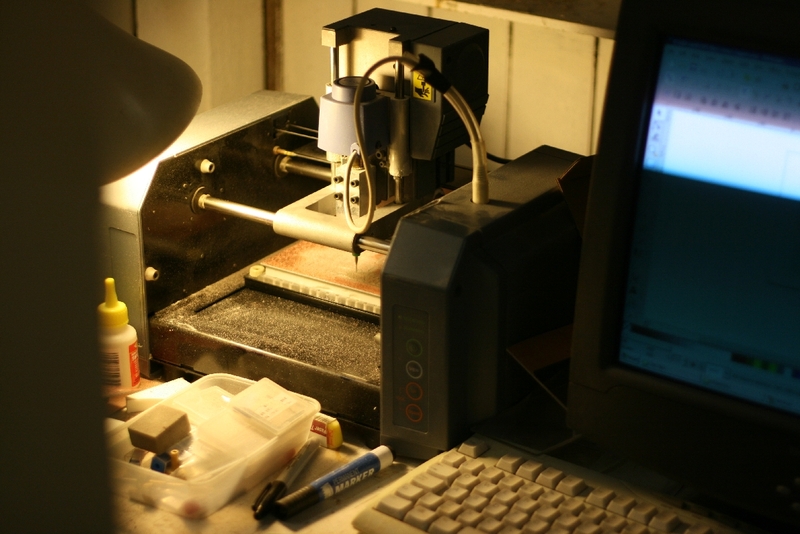 It was an excersize in how to design a PCB in Eagle and then mill it out on the Roland MDX-15 milling machine at work. At first I did a version of the Intervaluino, but one that all fit onto one board that was a shield that fit onto the arduino. 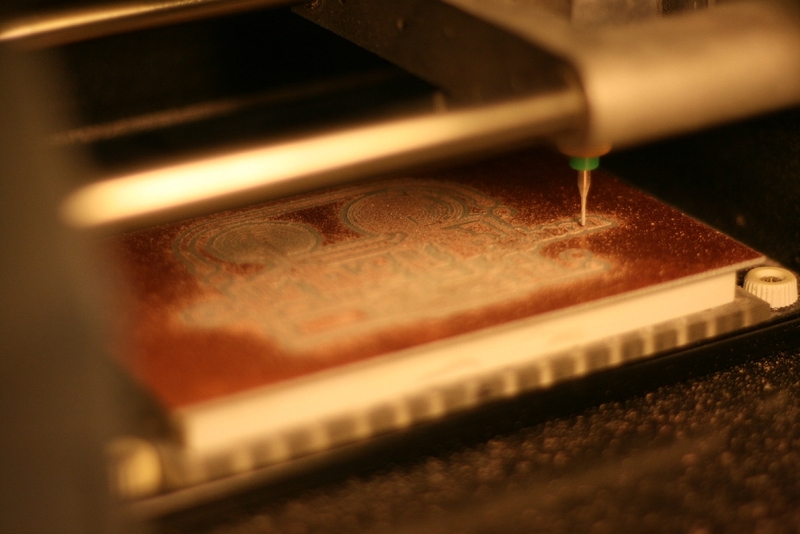 I didn’t realise how cool making shields for the Arduino is before. They just clip together like lego and you can just stack them one after the other. 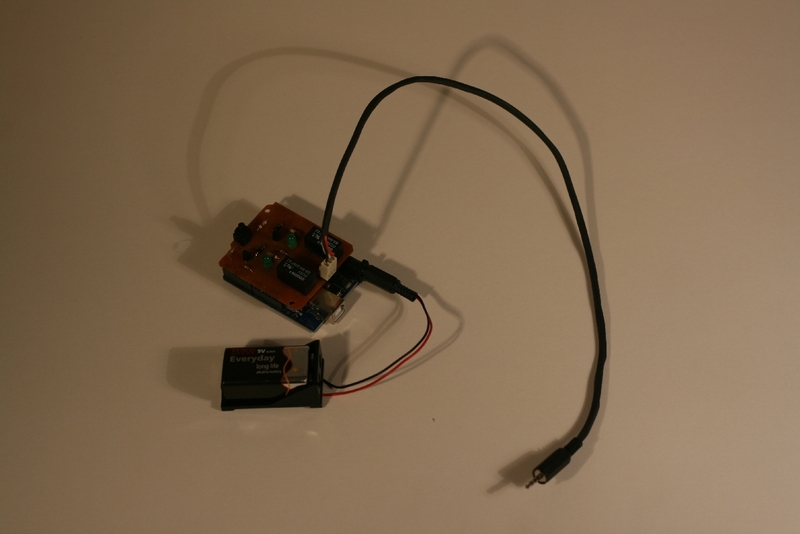 Anyway I found that the 20mA or so that the Arduino gave out wasn’t enough to trigger the relay. After a brief lesson in transistors from Sam I put together a circuit that would definately trigger the relays and had an LED for both the focus and shutter lines. 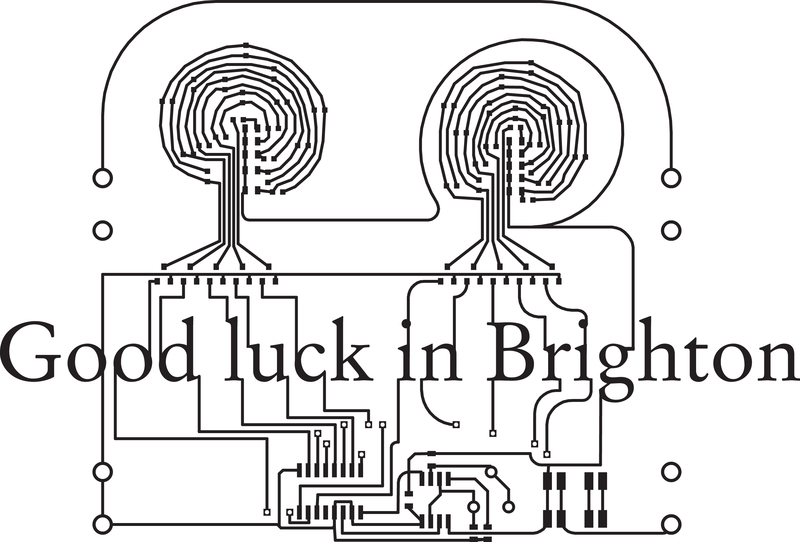 Above is the schematic of the final circuit. 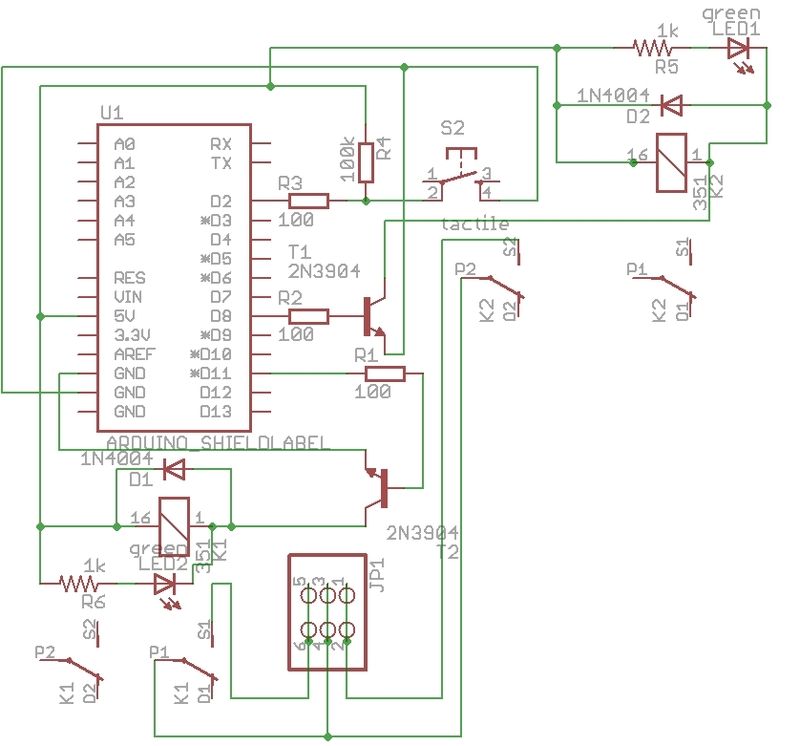 Basically what happens is the Arduino pins 8 and 11 go hi to 5V, making the circuit around the realy. This puts out about 20mA, which isn’t very much, so they turn on a transistor which allows the relay to access the current it needs to turn on. There’s one relay that connects the camera’s focus trigger to ground, which makes the camera focus and one relay that connects the camera shutter triggger to ground to take a picture. 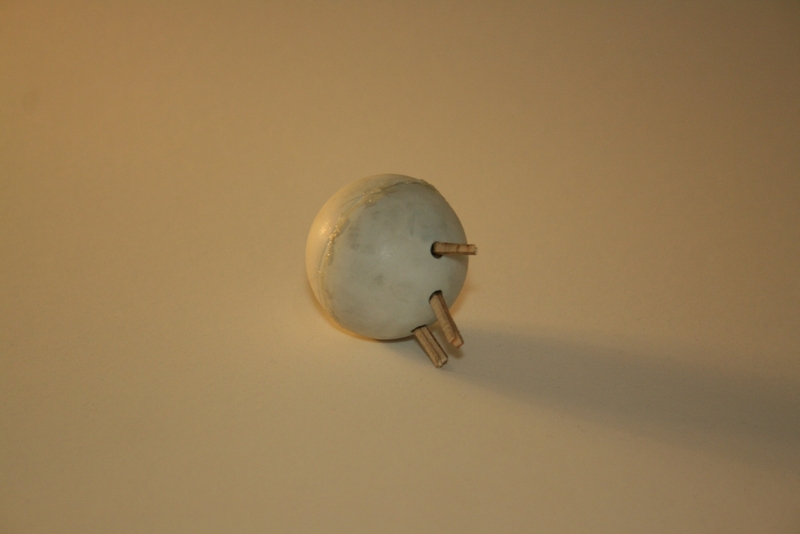 When taking time lapse movies it’s best to use manual focus so the focus pin is slightly redundant, but just in case…. I went through a few versions before I got the final working one. 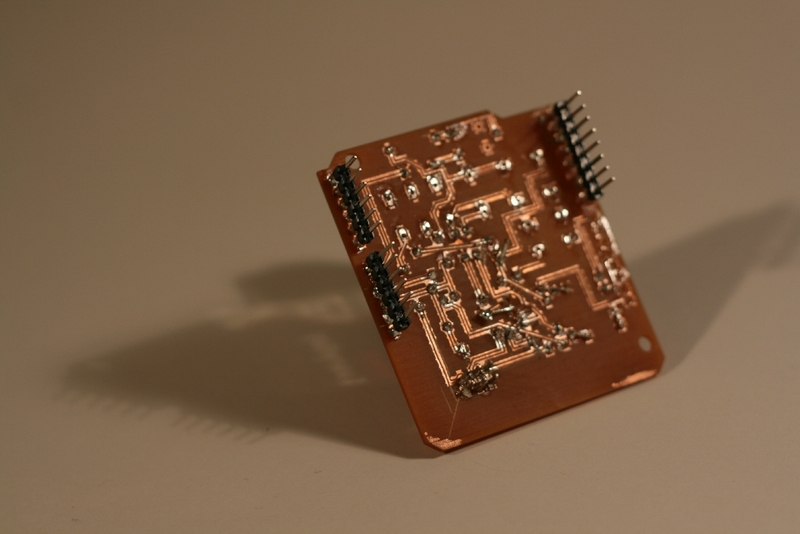 I milled out 4 boards and populated and soldered 3 before I had one that finally worked. Frustrating!!!! This is the first one. 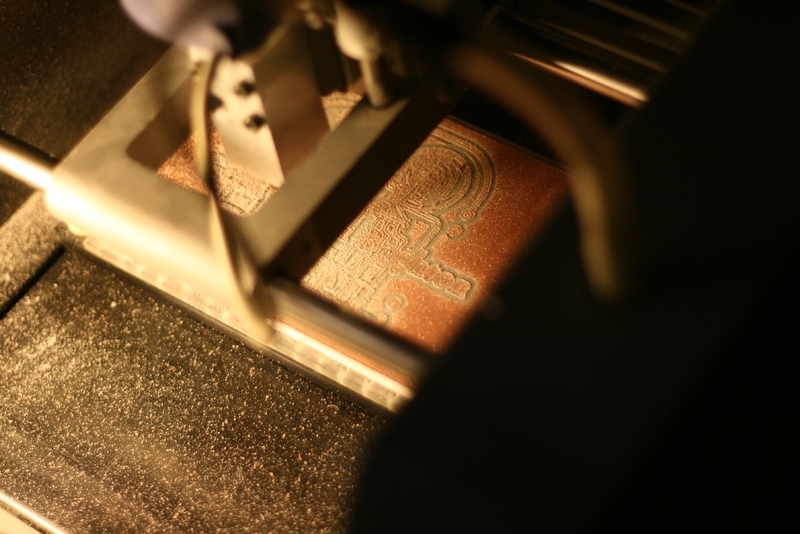 This is just cutting out the tracks with an engraving piece and not cutting away the unused copper. 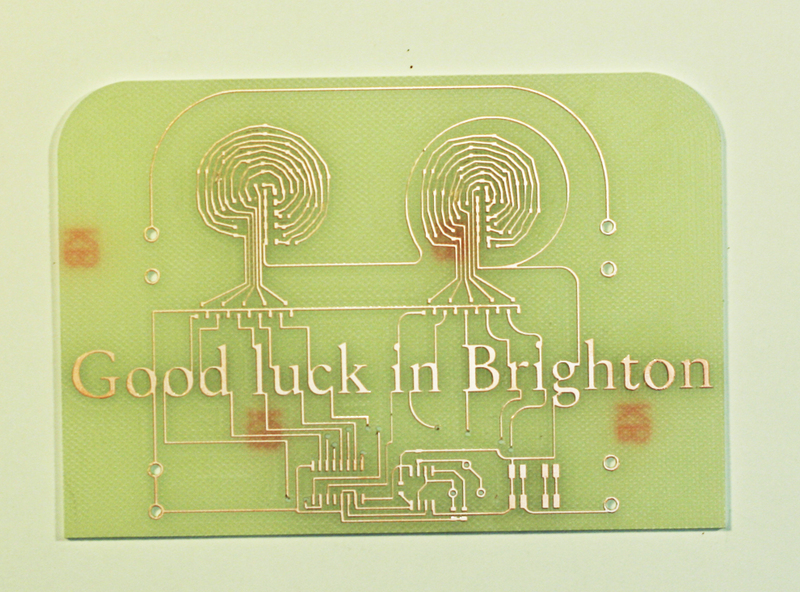 This makes it harder when your soldering, in case you make a mistake. As you can see on this version, I had set the tracks too thin and hadn’t left enough room at their sides to mill away the unused copper. This one is almost there, apart from I forgot to flip the pattern over. 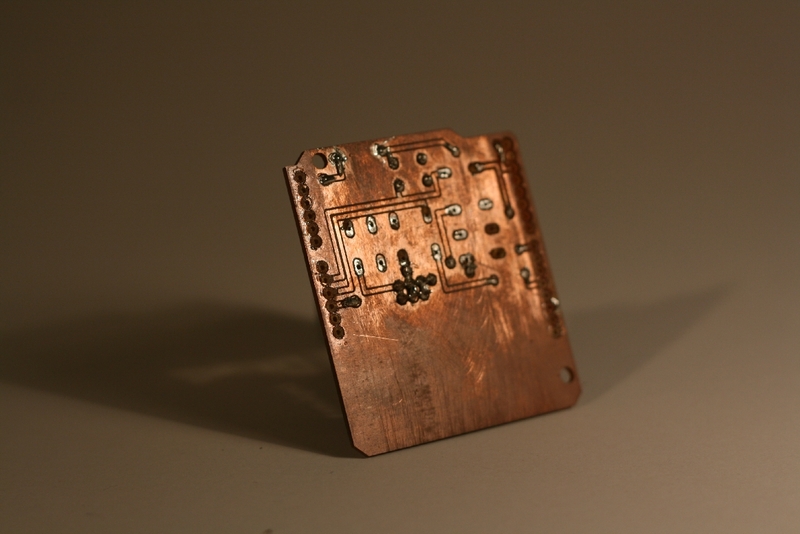 To make the components be on the opposite side from the Arduino, so they would fit on, I would have to solder every one onto the top side of the copper, whic is WAY too tricky for my patience. 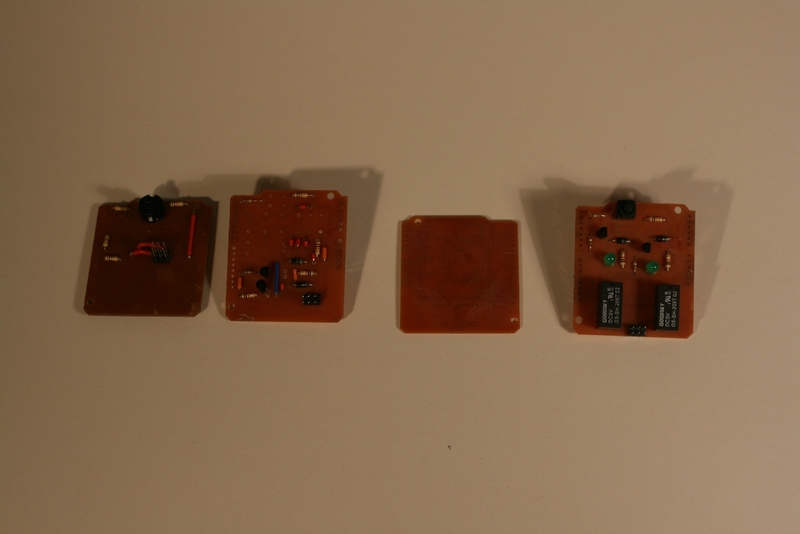 Here’s that final version, with the bottom photo showing it connected to an Arduino and a 9V battery pack with the 2.5mm jack that connects to the camera coming out. Message me if you want any of the files or if you know how I can upload them here. 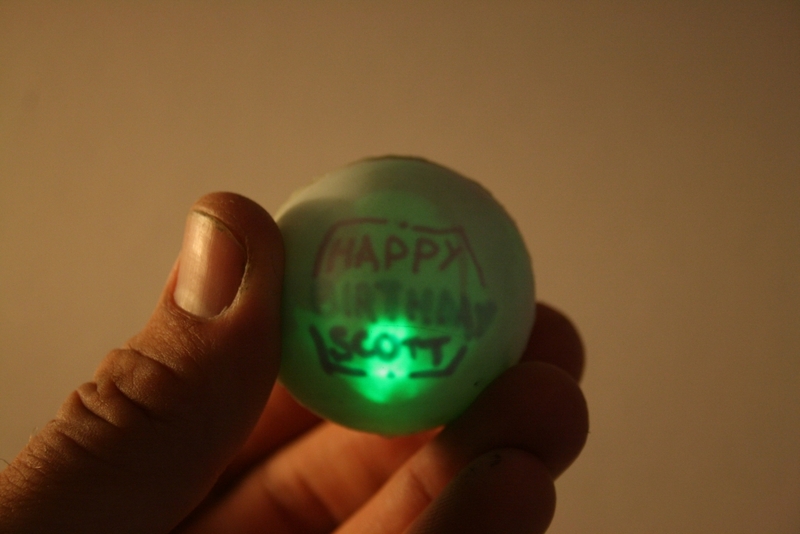 So it was my friend Scott’s birthday and I thought he deserves a pressie so I made him this pulsing ping pong ball thing. I originally wanted to have an RGB LED cycle through a load of colours sort at random similar to the processing sketch I did here. I didn’t know how to code the PIC chip to do that though so I just borrowed Jowan’s one that he’d made to puls on and off and routed 3 switches through the red green and blue connectors of the LED. 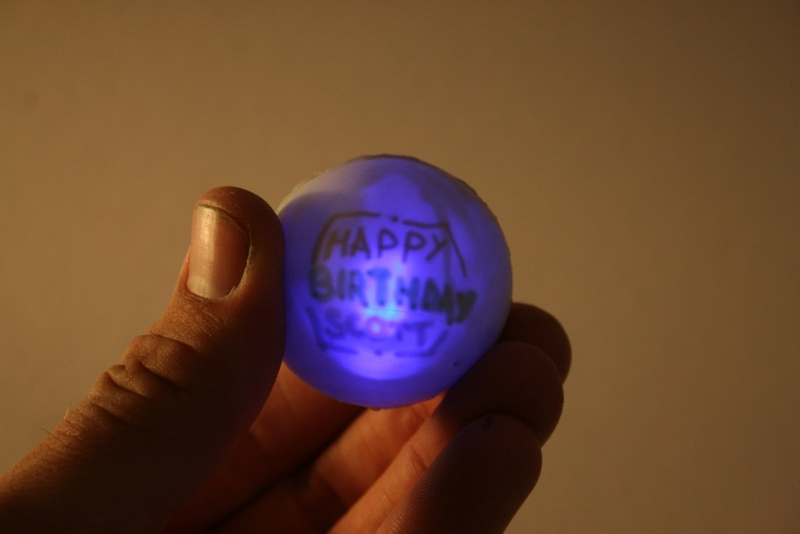 I realised that I could hide the word if it is written in ink that’s the same colour as the light, so blue text dissappears under blue light. That’s cool but it just hides one out of three words. I think it’d be better if it hid 2, so only 1 shows. Maybe if I wired the LED so that each switch lights up 2 colours to produce cyan, magenta and yellow, it would only light up 1 of the words. Next time next time. 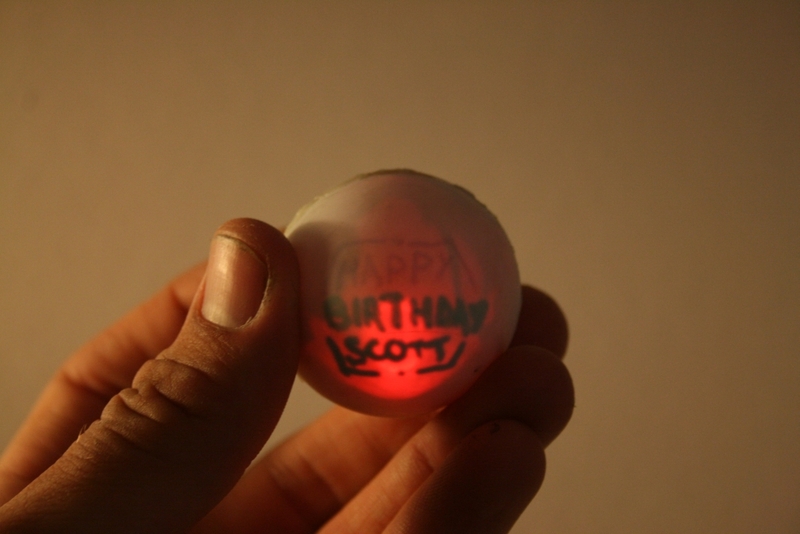 Pretty pointless and shamelessly geeky but Scott seemed to be not too offended so that’s OK.